Last week I read a blog post by @drtroyroddy titled "Suggested summer reading for teachers and parents." 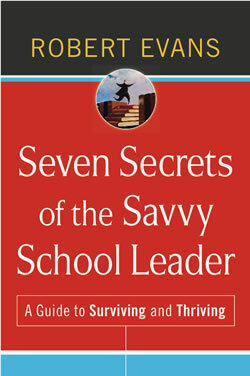 One of the books, "Seven Secrets of the Savvy School Leader", immediately grabbed my attention. I decided to purchase the book through amazon after reading a little more about the author and the book's content. In this blog post I will share some of the more profound and enlightening quotes from the first 3 secrets. It is my hope to challenge and stimulate thoughtful reflection for both current and aspiring educational leaders. "The popular leadership fads typically have much less relevance to schools than to corporations," and once these fads "heat up in educational circles, they cool in the corporate world." "Leadership is a matter of a whole person in a whole environment interacting in concrete ways with other whole persons in the immediacy and unpredictability of the moment." "Even if it were possible to change leadership styles, this would only complicate and weaken leadership." "Leadership that is based on techniques and styles is actually not leadership. It is manipulation, and it is ultimately self-defeating." "The leaders of high-performing organizations are not would-be "stylemasters." Rather, they tend to be people of strong character with strong commitments who maximize their strengths." "In leading, as in so much of life, there is simply no substitute for actual experience; those who haven't done it can't truly know what it is like." "Routine work drives out non-routine work and smothers to death all creative planning, all fundamental change, and make whatever grand plans you will, you may be sure the unexpected or the trivial will disturb and disrupt them." "Teachers become principals in part to make a difference, to right wrong and correct flaws that chafed them as teachers and to assert a vision of schooling as it should be. The first great shock awaiting them is discovering how little power they truly have." "The higher a person rises (in an educational system), the less direct contact he/she has with the organization's staff and clients, the more attenuated and filtered his/her personal influence becomes, and the more subject to misinterpretation are his/her actions." "The leader's actions send powerful messages, which, over time, shape the school community to its core." "Human beings are pattern-seeking animals, thus change almost always causes ambivalence and resistance." "Change and innovation threaten competence; Educators are required to abandon something they know how to do and adopt something they don't know how to do." "A leader must challenge his/her colleagues to face the realities they have preferred to avoid." "Change agents must demonstrate their caring and support, their commitment to work with staff to take the difficult steps in new learning." "Leaders must help colleagues link the new with the old, to see the future not as disconnected from the past but as related to it." "Teachers must be permitted time to complain. This opportunity can't last forever, but if it is denied altogether, resistance simply goes underground and undermines the necessary change." Hopefully these quotes will get you thinking and reflecting. Stay tuned for Part 2, secrets 4-7.